Today's photo is another one I captured in downtown Terrell; this one in front of the small florist on Catherine street. For a couple summers in college I worked at the K-mart plant/nursery dept in Greenville, Tx (long since gone =)) and could tell you the name of every flower - the names escape me now though. It's only been 20 years, I should remember! Whatever it is, it's beautiful. Brian, I'm enjoying your floral photos. I think this is a gladiola. Very beautiful! 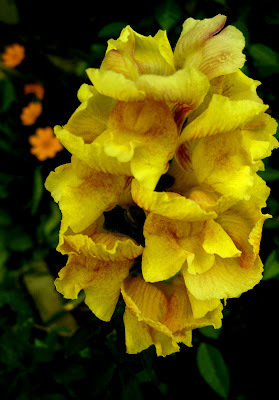 I loved this yellow flower, so delicate! Looks like this has already been identified, what a great image. Nice job. Could be a Gladioli but looks more like the snapdragons we have here, just a bigger version!